There's another -this time a video- interview released by the BBC via their media website in promotion of The Gamechangers. The video also features a few clips from the film. 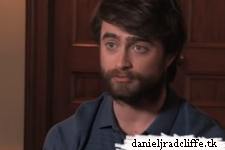 “The fact that it was a huge British cultural phenomenon that we don’t give ourselves credit for…we can definitely celebrate that a bit more.”In advance of The Gamechangers, we hear from Daniel Radcliffe on his starring role portraying Sam Houser, the British creative force behind Grand Theft Auto who battled with moral campaigners in the US.The Gamechangers. Tuesday. 9pm. BBC Two.